2018 will mark the centenary of women gaining the right to vote, following the passage of the Representation of the People Act 1918. 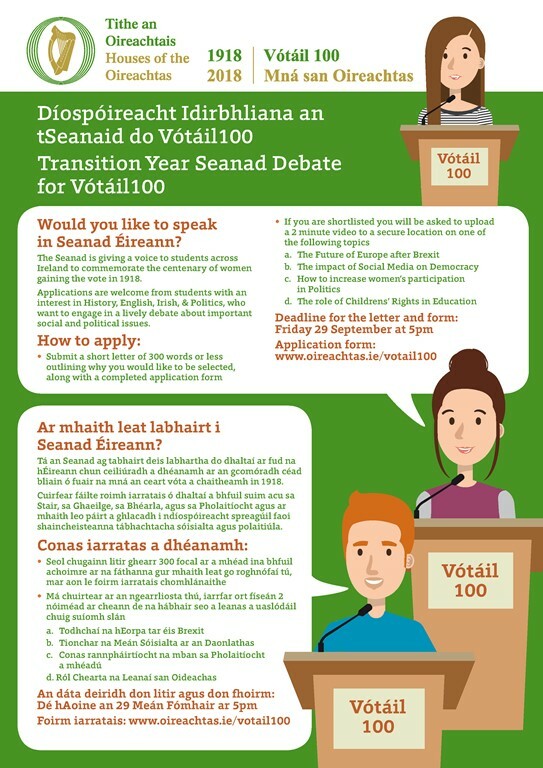 The Houses of the Oireachtas Commission will be marking this significant democratic milestone with a programme of events called Vótáil100. This programme will highlight the impact of wider voting rights, the history of the suffrage movement and its leaders in Ireland and of the representation of women in parliament. How to Increase Women’s Participation in Politics or The role of Children’s Rights in Education. Following adjudication of the video, all content will be destroyed in line with data protection legislation. The students finally selected will be mentored in public speaking, and participation will give students the opportunity to develop their confidence to present in front of an audience. It will also develop their insight into the role of the Oireachtas, gender equality, the role of civil society in democracy, and the legacy of the women who fought for the vote. A teacher guiding a student who is selected, will also be invited to Leinster House for the debate.